I'm just happy to be talking to a true white American. (SPOILERS) BlacKkKlansman illustrates, if nothing else, that Spike Lee is still entirely unable to judge when less is more. Only this time, his lack of discernment has come up roses, garnering him Best Picture and Director Oscar nominations. One can be cynical about this, crediting peer recognition to the picture’s socio-political currency rather than its quality, but then, wasn’t it ever thus with the Academy Awards? 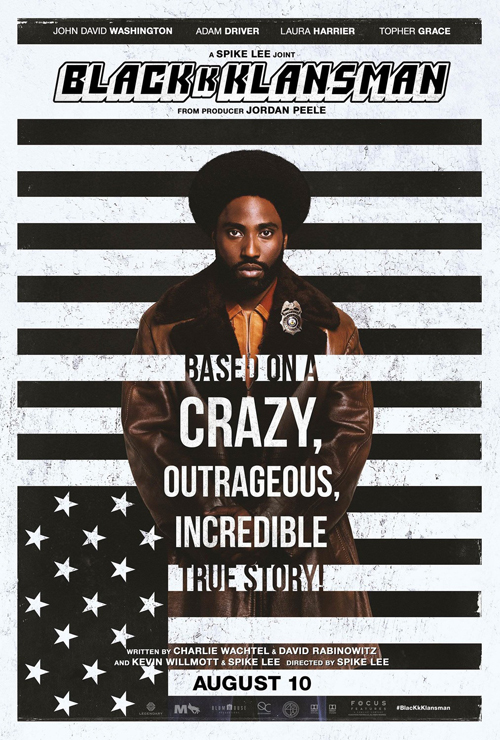 This really isa disappointing film, though, roundly failing to deliver on its you-couldn’t-make-it-up, must-see premise; one can only imagine how much more potent BlacKkKlansman might have been, had producer Jordan Peele opted to direct rather than bringing Lee on board. Peele is, after all, a dab hand at both comedy and drama; Lee’s credentials in the former are debatable, some might say negligible, and he hasn’t really proved himself in the latter in a decade or more. Lee’s film (for which he shares a screenplay credit with Charlie Wachtel, David Rabinowitz and Kevin Willmott) is neither fish nor fowl, sprawling carelessly across various genre signposts without ever settling down for coherence’ sake. The accompanying pace and tone are typically languorous; he’s quite happy to hijack the proceedings for a sledgehammer sermon here or over-indulge period pop-cultural referencing there, neither to the overall benefit of the whole. In particular, Lee’s embrace of Blaxploitation iconography – explicitly discussed in a scene between undercover Colorado police Detective Ron Stallworth (John David Washington) and student union president and activist Patrice Dumas (Laura Harrier) – feels like it could have slipped out of an early Tarantino flick, or a straight-faced version of Undercover Brother. And yet, while there’s abundant potential for razor-sharp humour in the material – a black detective (by way of the telephone and his Jewish alter ego, Adam Driver’s Flip Zimmerman) goes undercover in the Klu Klux Klan – Lee’s approach is so heavy-handed that the material never comes close to striking a balance between its genre – police procedural/ thriller – trappings, its aspirations towards satire and the impulse to reduce everything to overt commentary. This is Spike Lee, so the latter wins every time. Without internal tension to the fuel the proceedings, Flip’s immersion in the KKK’s racist invective quickly grows tedious; the impetus to shock the audience that people actually think this way can only pay off for a scene or two. Jasper Pääkkönen’s Felix is immediately suspicious of Flip, but the scenario rarely leads to genuine drama (an exception being the scene when he invites Flip to take a lie detector test). There’s also little actual detective work, presumably reflecting that the writers had to invent the third act – the actual historic case is acknowledged in passing, whereby the Klan attempted to position members in senior positions in NORAD – and what there is frequently feels ludicrously contrived. One never gets a sense that Lee is particularly engaged by or comfortable with the detective plotline, let alone the pulpier elements massaged onto it. Of which, ignoring historical accuracy is fine if it improves the storytelling; in this case, it only serves to detract from it. In particular, Lee delivers a succession of tonal missteps whereby elements of fact – Ron being assigned to protect David Duke, including the photo taken with him, although how he could possibly lose such a thing; it would be worth its weight in gold now – conflate with a contrived bomb plot and the blowing of Flip’s cover such that, rather than escalating tension, the results are more akin to letting the rest of the air out of an already sagging balloon. Lee’s approach seems to be: great, I’ve got a dynamite story, now I can hang my bag of preachy predilections on it to the point that it collapses in on itself. Eventually, you realise he isn’t so much digressing from Stallworth’s story as, in his scheme of things, Stallworth is the digression. So we have setting the scene in the most ponderous, obvious fashion, with Alec Baldwin spewing racist doctrine for a public information film, quickly followed by an excerpt from Gone with the Wind. At any point, Lee can’t resist this kind of overkill, such as the mesmerising effect of Kwame Ture’s (Corey Hawkins) words on his audience members, singled out in the darkness of the meeting room, as if they’re being touched by God. Later, Harry Belafonte recounts a horrific 1916 lynching, intercut with Flip being accepted into the Klan and watching The Birth of a Nation; this is Lee at his blunt-edged nadir, offering commentary that would stop the film dead in its tracks if it wasn’t gasping for air anyway. He’s preaching to the converted while simultaneously failing to come to grips with the story he’s (supposed to be) telling. And again, one’s led to conclude that it isn’t so much that he keeps getting distracted as that he never thought the story was especially interesting to begin with. Finally, to top it all off, he grafts Charlottesville footage on the back end, as if he was worried the Trump-Duke parallels weren’t explicit enough in the first place. Or that maybe his picture didn’t seem “current” enough. He’s at least partly rescued by his leads, who are both very watchable; Washington is likeably self-assured – possibly verging on too laidback, although that fits the more humorous side of the movie – while Driver seems incapable of putting a foot wrong. Elsewhere, though, the performers are let down by the material. The beats of Ron’s relationship with Patrice are pure cliché, up to and including his confession that he’s a police officer. The KKK members are idiots or psychopaths, which may be accurate but allows for little tonal variation or narrative progression. Both Duke (Topher Grace, failing to make much impression) and Chief Bridges (one-time Robocop Robert John Burke) are explicitly paralleled for asserting that black people provably sound different to white people (the pronunciation of “are”), but the utterance has more impact the first time (ironically, Duke delivers it second). The scene where Ron reveals his race to Duke over the phone ought to have been both the comic and moral high point, but instead it feels laboured, trying too hard, and fizzles (“I’ll be here all week”); there’s no actual satire in BlacKkKlansman, just a filmmaker stumbling about in the dark knocking into things, hoping that if he repeats the same refrain over and over again, someone will notice. Which they have, I guess. I think it’s fair to suggest BlacKkKlansman is a rank outsider for the top prize at the Oscars, but in its favour is that it’s in spectacularly average company, so anything’s possible. What it also has going for it is a crushing lack of subtlety, spoon-fed didacticism and scenes that probably have a rousing effect as soundbites even though they fail to add up to a coherent whole. Ideal Oscar material when you think about it. But actually, no, I don’t think it has a chance of winning the top prize.